Investing in young people’s health and well-being is essential for the development of future generations. Research is crucial in this process in order to promote knowledge on several factors that optimize health and well-being and produce behavioral and policy changes. We highlight the importance of giving voice to young people by encouraging an active participation (RICHE report, Ottova & Riche Consorsium, 2013). The promotion of ‘social capital’ (Putman, 1995; Morgan, 2010) and the prevention of ‘alienation’ (Seeman, 1959; Rayce, Holstein & Kreiner, 2008) among young people are effective strategies for the promotion of health and well-being. The creation of a network of young consultants as active collaborators in research projects on health behaviors will update research by identifying real issues and actively involving them in the promotion of their and others’ health. The objective of this project is the creation of a national network of young consultants, collaborators in research projects on health behaviors. · Elaborate a report “The health of Portuguese adolescents” as the ones previously written since 1996 by the researchers part of the national HBSC team (Matos et al., 2000, 2003, 2006, 2010, available at www.aventurasocial.com), but in the version “Dream teens: the health of Portuguese adolescents in direct speech”, i.e. a report elaborated by adolescents (under-18). In the report published by the European Project RICHE - Research Into Child Health in Europe, we highlight the priority of “giving voice” to children and adolescents with the aim of encouraging their active participation in research projects. This way, future investigations will be able to conveniently coordinate and identify their needs (Ottova & RICHE consortium, 2013). It is very important to encourage the participation of young people in this process, through groups of young consultants that actively collaborate in the development of research on health and well-being, with the ultimate goal of approaching it to reality and transform the results into efficient practices. Extracurricular activities, voluntary work and free time outside school are important ways to strengthen the bonds between the adolescent and the community. Here, they may develop leadership and decision making skills, increase the feeling of belonging and have adult social support (Matos, Gaspar, Ferreira & Equipa Aventura Social, 2013). One of the social factors that may affect the perception of health is ‘social alienation”, which refers to the separation, exclusion or isolation associated to those with social difficulties and not involved in communitarian activities (Safipour, Schopflocher, Higginbottom & Emami, 2011). In health, ‘alienation’ is associated to health risks, such as alcohol and other consumptions and the decrease in healthy activities (Jamner & Stokols, 2000). During adolescence, the feeling of ‘alienation’ is associated to several physical and psychological health problems (Rayce, Holstein & Kreiner, 2008). At school, adolescents may have less friends and less extended social networks, characteristics that may lead to symptoms of depression and other psychological issues (Hall-Lande et al., 2007). On the other hand, social capital is associated to health and well-being. When social capital is abundant, opportunities are available for an adjusted growth in educational and cultural areas, with lower levels of delinquency, maltreatment, child abuse, among others (Matos, Gaspar, Ferreira & Equipa Aventura Social, 2013). Social capital includes social ties among individuals: strong relations with a restricted group of people (bonding) and superficial relationships with extended groups (bridging). ‘Strong ties’ are the base of social support (ex. Family), however, the importance of ‘weak ties’ in social development, optimization of equity and equality of opportunities has been debated (friends and neighbor networks) (Granovetter, 1983). Using social capital as a resource for health and well-being may help build a support structure for empirical research in this area. Informal social networks may be a source of easy access to information and services and enable the development of health and well-being (Morgan, 2010; Matos, Morgan & Aventura Social, 2012). Safipour and collaborators (2011) recommend that educators and specialists develop interventions aiming at the prevention of alienation, by promoting family and communitarian support and the quality of friendships. The creation of a network of junior consultants may promote social capital and prevent alienation among young people, encouraging the participation active citizenship activities that promote healthy behaviors among peers. In Portugal, belonging to a social network (youth clubs and associations, for example) does not have a big expression in adolescence, which limits human support resources in case of difficulty and suggests a need to reinforce the sense of association among children and adolescents which demands, initially, adult support on logistics (Matos et al., 2013). A suitable strategy for the development of health and well-being in Portuguese youth involves the promotion of social capital and the prevention of alienation in school aged children, through their participation in activities that involve time spending with peers, the promotion and approximation of research on health behaviors to reality and a national wide change in policies and behaviors. It is essential to adjust research to young people’s real needs so that the results offer behavioral and policy changes. We aim at creating a network of junior consultants that are enrolled on year 6, 8 and 10 (ages part of the WHO’s international HBSC study – www.hbsc.org) and turn them into specialists on several areas related to research on adolescent health behavior. To support the transition to higher education, 12th graders will also be included. This network’s main objective is to promote social capital and prevent alienation among young people, updating research on issues that arise during adolescence and offering the participants an opportunity to be actively involved in the comprehension and approach to such issues. The network will be created with participants from all over the country that have interest on the challenge, with parental consent. We aim to recruit young people with a certain profile: specially interested in actively participating in comprehension processes and behavioral changes among peers, and participants that represent several cultural, political, religious, ethnic, among other tendencies. This process will have an application phase announced through online social networks, with the collaboration from schools, hospitals and other institutions associated to youth (ESCOLHAS, IPDJ, SICAD, RNAJ, CNJ, PNED, IAC, CPCJ etc. ), in articulation with the Youth Consultive Council and Youth Municipal Councils. After the online application, where demographic data will be collected along with a motivation and intention letter, live SKYPE interviews will be conducted in order to form a national under-18 team. For the main national team, 28 young people will be selected, one from each grade in each national region. In order to guarantee the representation of expressive groups in the Portuguese society under-18, 7 places will be assured (scouts, children with chronic illness, heads of student associations, athletes, artists, etc.). This will be defined in the final stage based on the 28 participants’ profile. For all the works required to this network of young people, an online network will be created in order to maintain permanent contact between junior and senior researchers, through Skype or Dialogue Café (Fundação Calouste Gulbenkian). The participants’ main focus will be the expression of their opinions on the issues brought up by the national senior team’s regular work. However, a brief training on research methods and techniques in health areas will be given. All the junior team participants (under-18) will have an active participation in the elaboration of research instruments and group debates on mental health, sexuality, substance consumption, self-harm, interpersonal violence, academic success and expectations, family support, social support networks, leisure, among others. Mainly, they will participate in the identification of emerging problematics, gaps and solution trajectories. We still aim to select an extended group of young people as collaborators, also one from each year in each national region (in a total of 280 participants). This extended collaborator team will be associated and in contact with the senior and junior national teams through electronic means and in annual general meetings. In order to encourage active participation in other young people, materials to disclose the developed works will be shared, such as ebooks, brochures and manuals, with the support from youth associations, institutions and, mainly, schools. Already existing partnerships with other isntitutions will be strengthened, such as Program Escolhas, Ministry of Education, Ministry of Health, international HBSC network (www.hbsc.org), Social Adventure Team (www.aventurasocial.com) / national HBSC team, Portuguese Institute of Sports and Youth (IPDJ), Intervention Service on Addictive Behaviors and Addictions (SICAD), Youth National Council (CNJ), National Network of Youth Associations (RNAJ), National Ethics Plan (PNED), Youth Consultive Council (CCJ) and Youth Municipal Councils (CMJ). 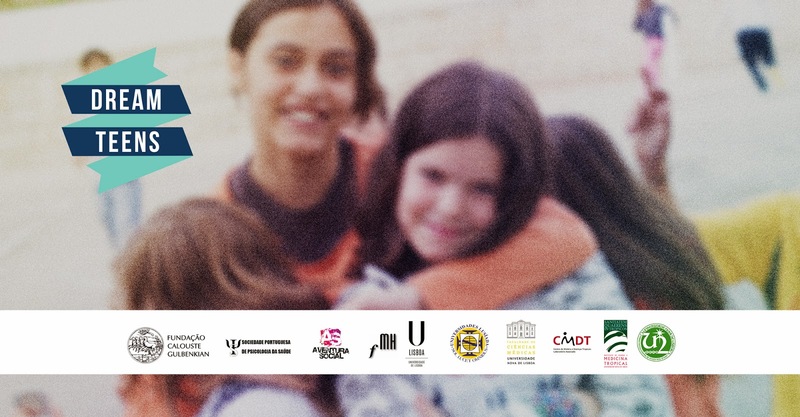 · November 2014 – First meeting with the adolescents (under-18) in Lisbon – final document with comments and orientations given by the participants. During the academic year 2014/2015 we aim to integrate the consulting team in the investigations and in the routines part of the implementation of public policies in the health area. They will accompany this process by optimizing the articulation between the senior and the junior teams and these and the Portuguese youth. Part of the WHO’s international HBSC study, a similar movement is being developed. Therefore, in the following years, an international team will be established to which the national team will be associated. · November 2015 – Organize the bi-annual HBSC (44 countries) meeting in Lisbon. During the three days, a meeting between the HBSC international senior researcher team and the Portuguese adolescents (under-18) will be held, integrating young people from other countries part of the HBSC study where the movement ‘young people’s voice and participation’ is ongoing. 1) To give ‘voice’ to adolescents’ needs, concerns and solutions (under-18). 2) Although this network is based on other already existing and organized networks, a niche and specific dynamic is found – ‘the adolescents’ voice and their participation in measures related to their health’. 3) Although this network implies a regular renovation due to the natural development of adolescent’s life, a permanent change will be installed as a new culture: the need and process to make adolescent’s lives more visible by giving them voice and space to participate in change. This dynamic is sustainable through its permanent incorporation in institutional cultures, with the support of existing structures, for the benefit of Portuguese adolescents. Also, this will place Portugal as a pioneer country in measures that increase young people’s visibility, autonomy and participation in health and well-being issues. Hall-Lande, J.A., Eisenberg, M.E., Christenson, S.L., & Neumark-Sztainer, D. (2007). Social isolation, psychological health, and protective factors in adolescence. Adolescence, 42(166), 265_286. Jamner, M.S., & Stokols, D. (2000). Promoting human wellness: New frontiers for research, practice, and policy. Berkeley: University of California Press. Matos, M.G., Gaspar, T., Ferreira, M. & Equipa Aventura Social (2013). Aventura Social no CED: Intervenção numa Comunidade Educativa. Lisboa: Aventura Social. Morgan, A. (2010). Social Capital as a health asset for young people´s health and wellbeing. Journal of Child and Adolescent Psychology, 2, 19-42. Ottova, V., Alexander, D., Rigby, M., Staines, A., Hjern, A., Leonardi, M., Blair, M., Tamburlini, G., Gaspar de Matos, M., Bourek, A., Gunnlaugsson, G., Tomé, G., Ramiro, L., Santos, T., Gissler, M., Vincenten, J., MacKay, M., Polanska, K., Popescu, L., Roth, M., Raat, H. M., Reli Veidebaum, T., Cerniauskaite, M., Meucci, P., Brand, A., Rasche, C., Rossi, G., Ravens-Sieberer, U., & The RICHE Project Group (2013). Report on the roadmaps for the future, and how to reach them. Putnam, R. (1995). Making Democracy Work: Civic Traditions in Modern Italy. New Jersey: Princeton, University Press. Safipour, J., Schopflocher, D., Higginbottom, G. & Emami, A. (2011). The mediating role of alienation in self-reported health among Swedish adolescents. Vulnerable Groups & Inclusion, 1-11. Seeman M. (1959) On the Meaning of Alienation. Am Sociol.,24, 783–91. The Social Adventure (www.aventurasocial.com) is a renowned national institution for health promotion in young people. 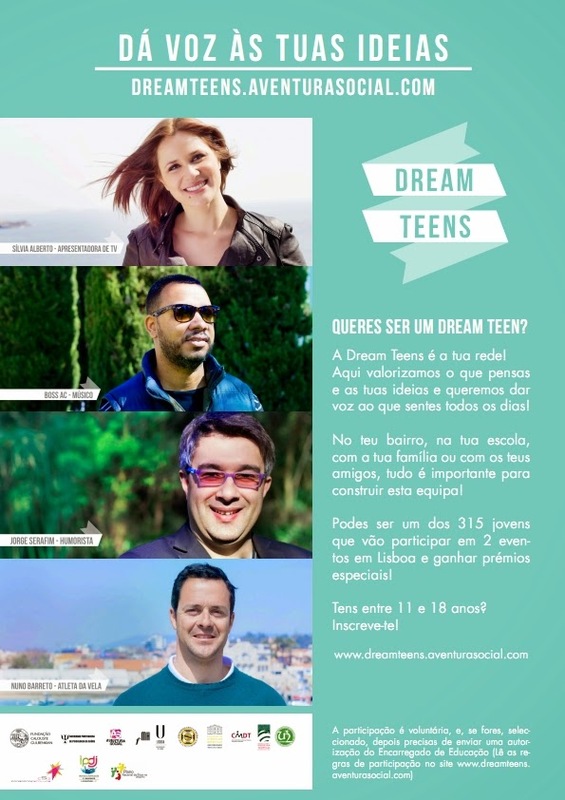 In March of 2014, a new project is officially launched – Dream Teens, in partnership with Fundação Calouste Gulbenkian and Sociedade Portuguesa de Saúde (Health Psychology Society). Its aim is to create a network of 35 young consultants (between the ages of 11 and 18) to work as a national team. Dream Teens aims to enhance both young people’s involvement and social responsibility through an active citizenship process. Introducing young participants to research, this national network also wants to make these teens’ lives visible by giving them ‘voice’ and increasing their social and civic participation in issues such as health. The project has ambassadors from several meaningful areas, such as television, music and sports. These where chosen by the young generations and are requesting their participation in the Dream Teens project. Sílvia Alberto, Boss AC, Nuno Barreto and Jorge Serafim are some of the names associated to Dream Teens. From this first stage, a larger group of around 280 young people will be selected as collaborators. This team will be associated and in communication with the senior national team through technological means and general annual meetings. The selected young participants will be present at two events in Lisbon, in November of 2014 and November of 2015, where they can give an ‘active voice’ to their opinions. The HBSC study (Health Behavior in School Aged Children) is an European study associated to the World Health Organization. The study integrates 44 countries including Portugal through the team responsible for this project (www.hbsc.org). The involvement of the WHO in this network is of the upmost value, mainly in the defense and implementation of participative intervention models based on positive and constructive perspectives (the asset model, Morgan, 2010), as the one presented in this project.